Spend another £17.12 to get FREE DELIVERY! Premier LVCF20T LoVolt 5 speed centrifugal fan with SELV transformer, built-in 2 minute delayed start over-run timer to continue the extraction of moisture and odours for between 30 seconds to 20 minutes after the unit is switched off, integral humidistat adjustable from 50-90% and integral pull cord for on/off, speed and trickle mode selection. The Safety Extra Low Voltage (SELV) versions of the Premier CF20 pressure developing centrifugal fans are ideal for use in shower rooms, bathrooms with showers and other zone 1 and zone 2 wet areas. 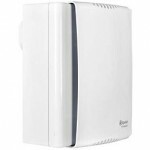 The SELV system consists of a 12V fan unit which can be safely installed in the spray area of a bath or shower, with the transformer located outside the spray area. Premier SELV fans have the same clean and sleek styling as the rest of the Premier range, with a white gloss body and fascia. They are designed for easy installation in walls, ceilings, windows or ducted installation at any angle. All models come complete with a universal mounting kit and an automatic backdraught shutter.